The ATLAS Experiment at CERN has just released evidence for the simultaneous production of three W or Z bosons in proton–proton collisions at the Large Hadron Collider (LHC). The W and Z bosons are the mediator particles of the weak force – one of the four known fundamental forces – which is responsible for the phenomenon of radioactivity as well as an essential ingredient to our Sun's thermonuclear process. The new ATLAS result is based on data collected by ATLAS during 2015–2017 at a collision energy of 13 TeV. 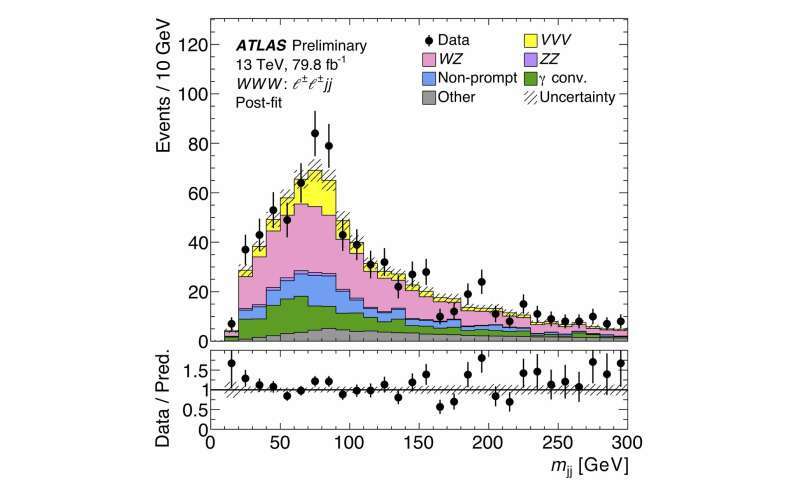 It provides evidence of "tri-boson" events with a significance of 4 standard deviations. This indication is but the latest chapter in a decades-long history of measurements with weak bosons. The W and the Z bosons were discovered in 1983 at CERN's proton-antiproton collider. In 1996, at CERN's Large Electron-Positron (LEP) collider, events with two W bosons were first observed, and shortly thereafter ZZ events were found. A decade after that, WW, WZ and ZZ events were observed at Fermilab's Tevatron collider. Large rates of diboson events are now produced at the LHC, allowing for precise measurements. Since weak bosons are unstable, they are reconstructed in the detector via their decays to pairs of leptons (including invisible neutrinos) or quarks – the latter forming sprays of particles, called "jets." 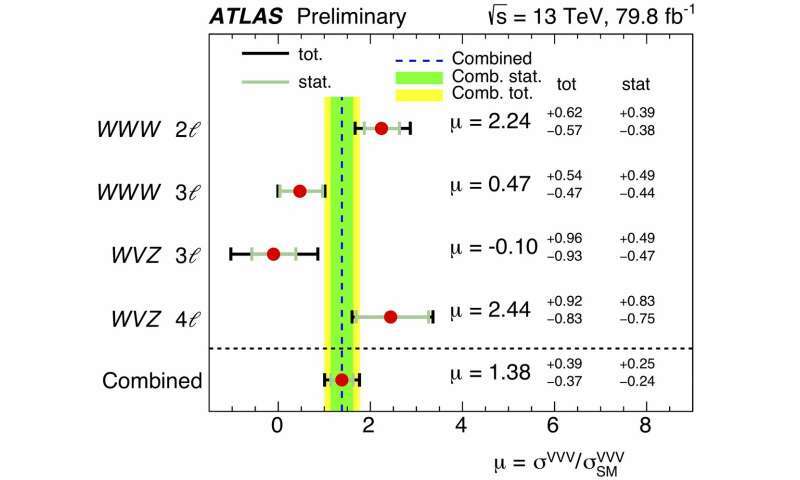 ATLAS physicists combined searches for different decay modes and different types of tri-boson production, including events with three W bosons ("WWW"), and events with one W boson, one Z boson and a third boson of either variety. The latter are known as "WVZ" events, where the "V" is a shorthand for "W or Z." One technique employed by ATLAS physicists to search for "WWW" events used the calculated invariant mass of two jets and compared this to the mass of the W boson (Figure 1). This allowed them to determine whether the jets were the outcome of a W boson decay. Such techniques have been used by physicists for decades (including in the 2012 discovery of the Higgs boson). The WVZ analysis, on the other hand, employs machine learning techniques to identify tri-boson events. Several multivariate algorithms in form of boosted decision trees (BDTs) were trained to learn which events in data are from tri-boson production and which arise from other Standard Model processes. By considering various features of the event – such as the momenta of the leptons, the overall momentum imbalance and the number of jets – the BDTs are able to deduce (more efficiently than humans) the origin of the data. Ultimately, the BDTs identified some of the data as likely originating from WVZ production. Altogether, the resulting ATLAS measurement (Figure 2) is found to be in agreement with the Standard Model prediction, thus providing one more piece of the puzzle in our understanding of particle physics.